A sacrament is a solemn Christian rite or ceremony through which God gives us his unmerited assistance (which we call grace) for our regeneration and sanctification. Sacraments are usually, but not always, administered in a church. Through each sacrament God bestows a particular grace such as incorporation into the Church, forgiveness of sins, or consecration for a particular service. The Church teaches that the effect of a sacrament comes by the very fact of being administered, regardless of the personal holiness of the minister administering it or the person receiving it. baptism, confirmation, Holy Eucharist (or Holy Communion), reconciliation, anointing of the sick, matrimony, and holy orders. The first three are sacraments of initiation, the next two are sacraments of healing, and the last two are sacraments of ministry. Though not every individual has to receive every sacrament, the Church affirms that, for believers as a whole, the sacraments are necessary for salvation, as they are the modes of grace instituted by Christ himself. Anglican churches recognise only baptism and Eucharist as “sacraments of the gospel” ordained by Jesus Christ. 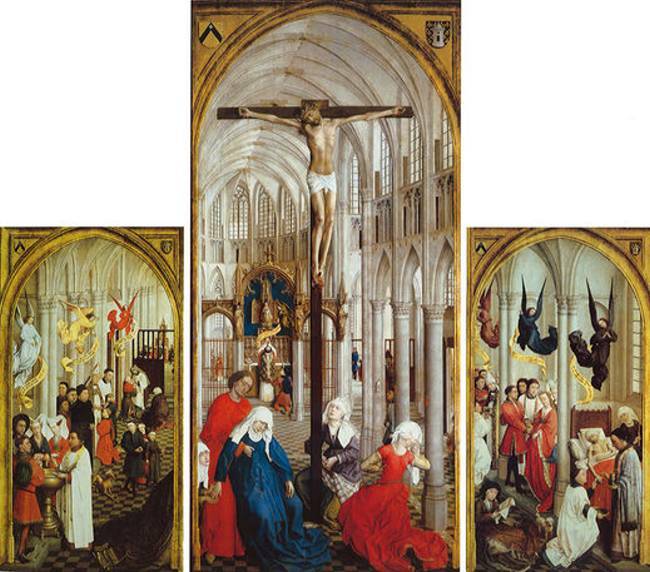 The picture shows the Seven Sacraments Altarpiece triptych by the artist Rogier van der Weyden. It was painted from 1445 to 1450 and depicts the seven sacraments. The menu on the left provides access to a series of articles on the sacraments. The articles are not exhaustive and are not highly theological. Instead, they provide a little information of a general nature that anyone might like to read. We hope that you find the articles useful.